India’s National Telecom Backbone Bharat Sanchar Nigam Ltd (BSNL) launched its 3G GSM mobile and High Speed Wireless Internet services (Data services) in Karwar city of Uttara Kannada Telcom District in Karnataka telecom circle. BSNL 3G services inaugurated by Mr. SB Khare, General Manager, in presence of AG Kittur, Deputy General Manger and MG Hegde, DGM BSNL(Accounts). The BSNL 3G Prepaid Sim Card cost Rs.59 and as an introductory offer the new 3G subscribers will get 50 free video calls and 25 MB Data usage. Beyond free usage Local Voice and Video calls will cost just 30 Paisa per minute and all STD video calls will be charged at 50 paisa. 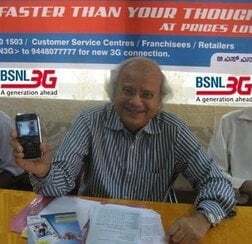 BSNL 2G prepaid mobile subscribers can migrate to 3G service just by one SMS “M3G120″ to 53733 while for postpaid subscriber can send “M3G25″ to 53733.